Have you been looking for some unique Father’s Day jewelry get dad this year? 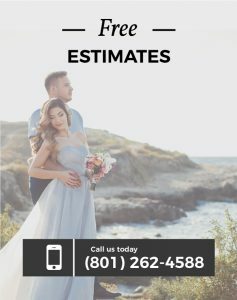 Then you may have found the right place because this custom made elk ivory jewelry in Salt Lake City is the perfect Father’s Day gift for dad! Is your dad or husband an outdoorsman or a really awesome hunter? Then he would probably be interested in an amazing gift from these custom jewelry makers in Salt Lake City, Utah. Elk ivory jewelry is a type of western jewelry made from elk teeth. 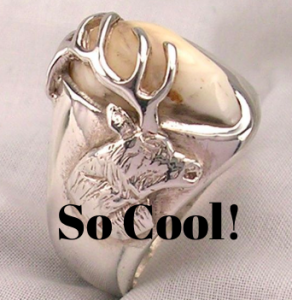 These elk teeth rings have become very popular in the outdoorsmen and western communities. There is a really good article that Montana Outdoors wrote about the unique history of elk ivory and its uses throughout the ages. If your dad or man is the type of guy that likes to show off his trophies these elk rings in Salt Lake City will suit him well and they look spectacular! There has been a long history of men, especially really awesome dads, showing off their sweet hobbies. This is just another way for them to look cool while being awesome. If you think that enamel jewelry couldn’t get any more alluring well you should see the things they’re doing today to make it look just so beautiful. It’s just a matter of time before more people start wearing this type of gorgeous jewelry and now is the time for you to make sure your loved ones are first to the party. I mean what could possibly be cooler than a sweet hunting ring? Wives, maybe it’s time you update his wedding band with a new custom men’s hunting wedding band. As we all know, Father’s Day is just around the corner and we will all be rushing to find dad the perfect gift. Well, this year why not get him something unique that the whole family can enjoy? This is something dad will love to go around showing off to his friends. Nothing says I love you to Dad better than these kinds of personalized Father’s Day gifts. Every year people want to do something unique for their pops but most of the time end up getting him something all the neighbor’s dads have too. This year one of the best Father’s Day gift ideas is some incredible elk teeth jewelry. 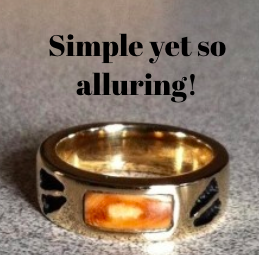 It doesn’t even have to be an elk tooth ring like the ones you see above. 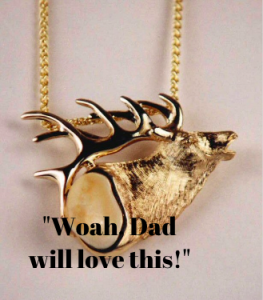 An elk ivory necklace will also look good on dads muscular chest. See, now we are talking about some seriously great looking hunting jewelry! One final thing to be discussed regarding the sheer awesomeness of ivory jewelry is the mystical powers some ancient natives believe that it held. According to this article, elk teeth is associated with masculinity, endurance, and bravery. So now if you get your dad something this awesome he has that to look forward to as well. Once you get your dad or husband some sweet manly jewelry he can rock up and down the mountain while he’s out hunting, fishing, hiking, or whatever else incredible things that man is up to, he will always be able to look at his jewelry made from elk teeth to remember you by. By now you should be thinking to yourself “wow, I can’t believe I’ve read such a useful blog to help me come up with a decision for a Father’s Day gift!” Well, you’re welcome. Afterall, elk ivory jewelry is the perfect Father’s Day gift.